Miracles by definition are extraordinary events manifesting a supernatural work of God—an unusual event or accomplishment, a wonder, a marvel. A never-ending supply of miracles have made up Susie Jennings life since November 1993, when she and a group of volunteers distributed 100 new blankets to the homeless living under the Canton Street bridge overpass in downtown Dallas. In 31 Days of Mountaintop Miracles, Susie shares the legacy of a blanket distribution project that through God’s grace and guidance has grown from an unthinkable tragedy into Operation Care International (OCI), a worldwide outreach ministry, dedicated to caring for the homeless in Dallas, Texas and impoverished children around the world. With Allison Bottke, bestselling inspirational author of the Setting Boundaries series. Miracles by definition are extraordinary events manifesting a supernatural work of God—an unusual event or accomplishment, a wonder, a marvel. A never-ending supply of miracles have made up Susie Jennings life since November 1993, when she and a group of volunteers distributed 100 new blankets to the homeless living under the Canton Street bridge overpass in downtown Dallas. In 31 Days of Mountaintop Miracles, Susie shares the legacy of a blanket distribution project that through God’s grace and guidance has grown from an unthinkable tragedy into Operation Care International (OCI), a worldwide outreach ministry, dedicated to caring for the homeless in Dallas, Texas and impoverished children around the world. With a spirit of unconditional obedience, Susie and her OCI Team have reached over 130,000 homeless men, women and children in the Dallas Metroplex area and conducted major outreach efforts to change the lives of thousands of impoverished children in nine countries, including; the Philippines, India, Africa, Taiwan/China, Indonesia, Cambodia, Jordan, and Israel. OCI has been faithful in carrying the message of love and hope to those in need through the power of the Gospel of Jesus Christ. With over 3,000 volunteers and serving 8,500 + homeless, OCI hosts the nation’s largest Christmas party for those in need, held every December since 2004 at the Dallas Convention Center. 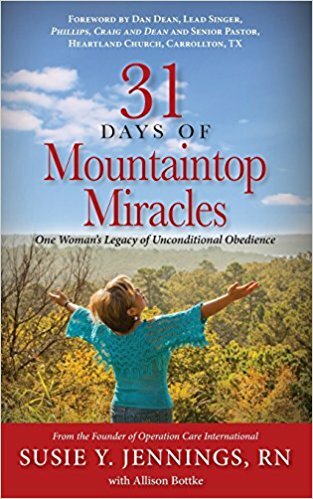 31 Days of Mountaintop Miracles is one woman’s legacy of what can happen when life is lived with unconditional obedience to the Lord. At the end of each day, Susie challenges readers to Master a Miracle Mindset to look closely at the blessings of life through the eyes of a God who deeply loves them—a God who has a miraculous plan and purpose for their lives. It is through His provision that miracles can and do happen. Written with Allison Bottke, bestselling author of the award winning Setting Boundaries series.